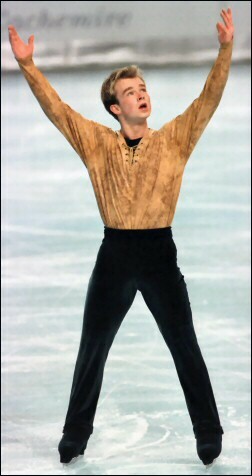 Stefan Lindemann was the first German man to win the World Junior Figure Skating Championships in 2000. For the last several years, three German men have battled for the top of the podium at German Nationals – Stefan Lindemann, Silvio Smalun, and Andrejs Vlascenko. But this year, the stakes are higher. The World Championships are in Germany for the first time since 1991 and the winner will represent Germany there. “My goal for this season is to go to the Worlds in Dortmund,” Lindemann said, “but it will be very hard.” On Jan 4, he met that goal by winning the 2004 German Figure Skating Championships. The 23-year old has had some success on the international circuit, finishing as high as eighth at Europeans in 2000 and 13th at Worlds in 1999. He was the first German man to win the World Junior Figure Skating Championships in 2000. This season, he finished ninth at Skate America and 11th at Trophée Lalique. Lindemann began skating when he was four. “My father wanted me to be a soccer player like he was, but my mother thought I should try skating so she took me to the rink. I do play soccer sometimes, but just with my friends to relax.” He landed his first triple jump, a triple toe loop, when he was thirteen and his first quad, also a toe loop, when he was 16 or 17. “I like jumps the most,” he said. “It’s a great feeling to be in the air, turning around four times. It’s like flying.” He has also been practicing the quad salchow and the quad lutz, but hasn’t landed any of the jumps cleanly. Lindemann has already gone into the record books as the first German to land a quadruple jump in competition at the Bofrost Cup on Ice, where he won both the jumping competition and the long program to take the overall gold medal. “I enjoyed the jump competition at the Bofrost Cup very much,” he said. “I was very relaxed there. There was more audience participation and more fun. For me, it wasn’t as difficult as doing a short program. I like the new judging system too. It’s good that you can move up many places by yourself and not because of other skaters’ mistakes, but I don’t like it when you two-foot a harder jump and get less credit than a clean lesser jump. From the judges marks at Skate America, I saw that my marks for spins were not so good, so I’ve been working more on spins in practice, but spins are hardest for me.” Lindemann noted that in the non-CoP competitions he will be attempting a quad toe/triple toe in both his short and his long programs. “I want to get the feeling for doing it in every program,” he added. For fun, he likes to play tennis, visit clubs, and watch movies, especially comedies and movies with George Clooney and Robert DeNiro, his favorite actors. He saves all the badges from his skating events and keeps the toys he receives in his apartment. “I use my computer a lot at home,” he added. “I use it for email and to see what’s new in the world and in skating.” On holiday, he likes to go to either to the beach or to the mountains for skiing. “Last year was the first time I went skiing for five years,” he noted. Lindemann, who speaks German and English, plus a little French and Russian, enjoys travel. “I want to visit Australia to visit my cousin in Sydney some day,” he said.